Yamaha rider Maverick Vinales was left with "very negative feelings" after the Jerez MotoGP race, having had to push "110%" just to secure a muted seventh-place finish. Vinales's optimism from a strong showing in the previous round at Austin was dashed once more as he and fellow Yamaha works rider Valentino Rossi lacked pace and rear grip in daytime heat at Jerez. The Spaniard, who ran outside of the top 10 for most of the race and whose eventual result was flattered by heavy attrition ahead of him, said there were no positives to take out of the weekend. "Very negative feelings," Vinales admitted. "I came from Austin feeling really well after the race because we had made good steps. "But here we came to the reality, the bike right now is far away from the top. "We rode 110% of the bike to P7, and if the riders [ahead] didn't crash we were 10th. "It is difficult to tell something special because I felt really bad." Vinales struggled to conceal his frustration at having had to battle with the customer bikes of Nieto Ducati's Alvaro Bautista and Marc VDS Honda rookie Franco Morbidelli in the race. "I was behind Alvaro and Morbidelli, who rode a fantastic race, but even with that this is not our place," he said. "Our place is fighting for the podium, some places [for the] win, and it's frustrating honestly because I cannot ride." Like his team-mate Rossi, Vinales again insisted Yamaha's poor performance in the Spanish conditions stemmed from electronics - adding that he felt he had no way of countering the bike's weaknesses. "It's 10 months I am telling the same, I have no grip, no grip, 10 months. When I arrive at the tracks that are maybe a little bit hot, maybe the track is not perfect, I have no grip, it's impossible," he said. "One weekend I have to ride three riding styles, different styles to make the bike work and nothing works. 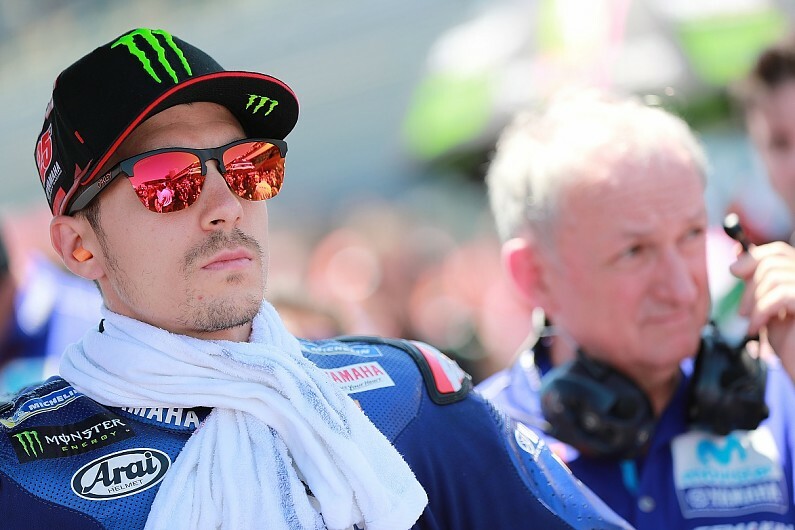 "So I ride like [Jorge] Lorenzo-style, I try to make everything for the bike to work, and finally we have the same problem that the bike is not accelerating. "So that means it is only one thing: it's the electronics that are not working, for sure." Vinales was fourth, four tenths of a second off the pacesetting older-specification Tech3 Yamaha of Johann Zarco, in the post-Spanish Grand Prix test on Monday. "Monday is always positive but we have to be positive on Sunday," Vinales said. "We still didn't solve nothing."